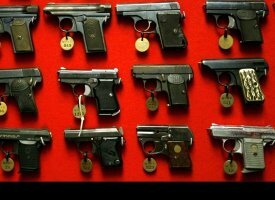 As the gun control debate become exhaustive and the international community seems to have an easier time getting their act together than Congress, Connecticut has decided to take action statewide to protect their citizens and put some minds at ease a mere three months after the Sandy Hook shooting that claimed so many lives and intensified the gun debate. Connecticut Gov. Dannel Malloy (D) on Thursday signed comprehensive gun control reforms less than 12 hours after the state legislature approved it in a late night session according to Huff Post. Malloy during the signing ceremony commented that the event was profoundly moving saying Connecticut came together as few other places have and are able to do as Washington remains divided (thank you NRA and second amendment supporters) and lawmakers have no excuse to expand background checks. Both of Connecticut’s two Democratic senators, Richard Blumenthal and Chris Murphy, supported the expanded gun control which requires background checks on private gun sales, bans the sale of magazines holding more than 10 rounds, and expands the state’s assault weapons ban including new gun models. As Malloy stated, the provisions will be in effect immediately with others being phased in. The bill also has new registration requirements for high capacity magazine owners who purchased before the law and creates the nation’s first dangerous weapons offender registry. The legislators during Wednesday nights session applauded the bill as it will allocate $15 million more to school safety and mental health monitoring programs. Many of the families who were affected by the deadly shooting at Sandy Hook Elementary in Newton were present for the historic signing and President Barack Obama will also visit Connecticut on Monday to applaud the new reform as well as make a case for broader gun control measure being debated by Congress. Pope Benedict’s Final Address At Vatican Fills St. Peter’s Square With Emotional Farewell (VIDEO) (PHOTOS). On Wednesday with the same fan fare as when he came in as pope, Pope Benedict addressed an estimated 150,000 people at St. Peter’s Square as he bids an emotional farewell to his flock stating that he understood the weight of his decision but in his heart felt that it was for the good of the Roman Catholic Church. His final audience was the day before he steps down as pope and live a life of meditation and prayer safely behind the Vatican walls in a renovated monastery. Benedict told the faithful that the crisis hit papacy had moments of joy but also difficulty when, “It seemed like the Lord was sleeping and “There were moments when the waters were choppy and there were headwinds.” The speech given from an ivory throne on the steps of St. Peter’s Basilica were interrupted by applause from the crowds and when it was done he finished his speech the crowd and his red hatted cardinals gave him a standing ovation. Benedict will abdicate as pope on Thursday night as the cardinals begin their consultations ahead of the conclave to choose the new pope. During his speech to the faithful he commented on the future of the torubled church by saying: “I took this step in the full knowledge of its gravity and rarity but with a profound serenity of spirit” and that loving the church meant, “having the courage to take difficult and anguished choices, always having in mind the good of the church and not oneself.” An enormous crowd from Italy and abroad came together in the square in the early morning for the mid wek audience that is normally held inside but was moved outside to accommodate the faithful who wanted to see the pope one last time. Even with the ongoing church conficts from within and from scandals outside, many were supportive of the pope and his decision as Sister Carmela, who came to see the pope with fellow nuns from her nothern Italy parish, said,”He did what he had to do in his conscience before God…This is a day in which we are called to trust in the Lord, a day of hope. There is no room for sadness here today. We have to pray, there are many problems in the Church but we have to trust in the Lord.” To be fair, not all agreed with Sister Carmela, Peter McNamara, a 61 Australian of Irish descent, commented that,” He’s a disaster. It’s good for everyone that he resigned.” Like many McNamara came to witness history being made. The Vatican said that Benedict after his retirement will assume the title of “pope emeritus” and be addressed as “your holiness”. He will wear brown loafers made for him by a shoemaker in Mexico and a simple white cassock according to Lombardi. On Thursday, Benedict will greet the cardinals in Rome whom will elect the next pope before he fly by helicopter to the papal summer retreat at 5p.m. 15 minutes from Rome. 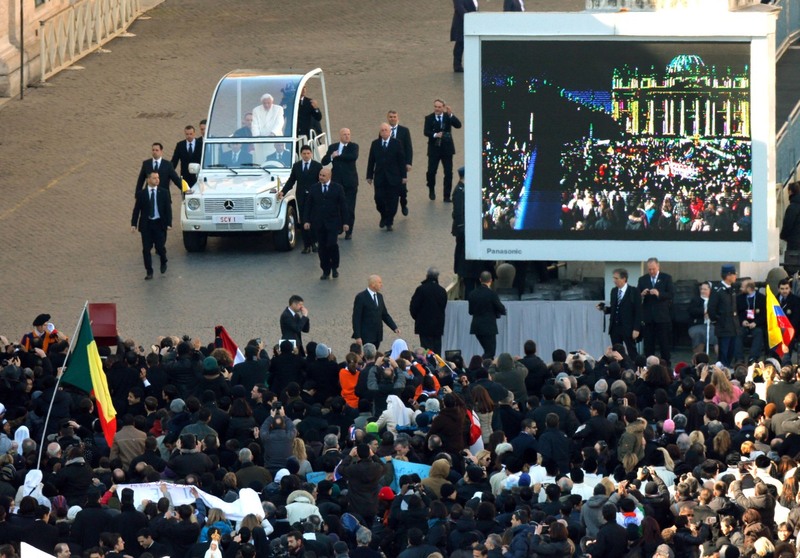 When he arrives, he will make an appearance from the window of the papal villa to greet his well wishers which will be his last audience. At 8 p.m. the Swiss Guard will march off as a sign that the papacy is vacant. On Friday, cardinals will meet in a general congregation to prepare for the conclaves. This week Benedict changed the Church rule so cardinals could begin the conclaves earlier than 15 days after the papacy becomes vacant allowing the cardinals to determine when it starts. The Vatican hopes to have a new pope elected by mid-March and installed before Palm Sunday March 24 so he can preside over Holy Week services leading to Easter. An informal consultation has begun already two weeks prior when Benedict said he was quitting between cardinals. John Kerry, U.S. Secretary Of State, Defends Americans’ Right To Be Stupid. Scary enough I actually agree with the logic here, hey here me out before you decide otherwise. U.S. Secretary of State John Kerry defended the freedom of speech, religion and thought on Tuesday by telling German Students that in America “you have the right to be stupid if you want to be”, according to Reuters. When you first read it I know sounds insulting but let him explain. Kerry continued to tell the students in Berlin that, ” As a country, as a society, we live and breathe the idea of religious freedom and religious tolerance, whatever the religion, and political freedom and political tolerance, whatever the point of view.” He continued with “People have sometimes wondered about why our Supreme Court allows one group or another to march in a parade even though it’s the most provocative thing in the world and they carry signs that are an insult to one group or another.” Oh you want a reason then I suppose, well he gives that to”The reason is, that’s freedom, freedom of speech. In American you have a right to be stupid – if you want to be.” As the students laugh, he then said, “And you have a right to be disconnected to somebody else if you want to be….And we tolerate it. We somehow make it through that. Now, I think that’s a virtue. I think that’s something worth fighting for. The important thing is to have the tolerance to say, you know, you can have a different point of view.” You know John Kerry I like you more now than I have in the pass purely because he is the first person to admit that. As a country, we are forced to tolerate everything regardless of whether we agree or not with what is being done or said to us it is a part of Americana. The reasoning has played out in our favor at times and sometime to our detriment but in the end I am glad we have the freedom to express ourselves and opinions even if it is not in the majority. Kerry made the comment in Berlin his second stop on his inaugural trip as Secretary of State which began Feb.1 and will take in on one night stops to London, Berlin, Paris, Rome, Ankara, Cairo, Riyadh, Abu Dhabi, and Doha before returning to Washington March 6. Kerry also did a little reminiscing with the student talking about his 1950s adventures in Berlin being a son of a diplomat roaming through the streets of East Berlin with his bike. He said, “I used to have great adventures. My bicycle and I were best friends. And I biked all around this city. I remember biking down Kurfuerstendamm and seeing nothing but rubble. This was in 1954 … the war was very much still on people’s minds…One day, using my diplomatic passport, I biked through the checkpoint right into the east sector and noticed very quickly how dark and unpopulated (it was) and sort of unhappy people looked…that hit this 12-year-old kid…I kind of felt a foreboding about it and I didn’t spend much time. I kind of skedaddled and got back out of there and went home and proudly announced to my parents what I had done and was promptly grounded and had my passport pulled.” Time will tell if Kerry will be able to fill the shoes of his predecessor Hilary Clinton, but for now we will have to wait and see.